Tooth paste! Well actually a gel! Natural, unsweetened with marigold and chamomile, suitable to use from the very first tooth! 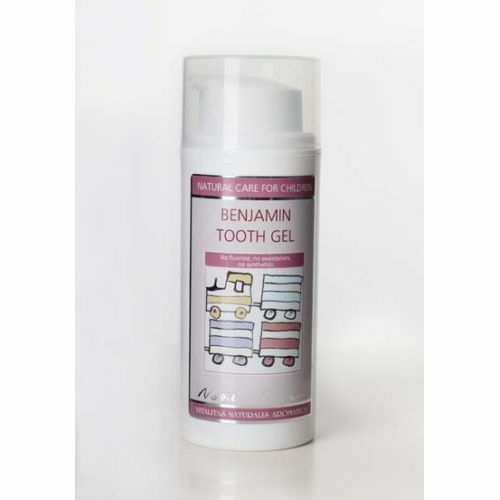 This very gentle non-foaming gel has a positive effect on gums and the mouth, protecting against mouth ulcers, tooth decay and tartar whilst soothing irritation. Contains no fluorine, sweeteners, synthetics or petroleum derivatives. It leaves a feeling of freshness and purity. It does not affect the normal sense of taste and is completely safe if swallowed. Natural plant extracts and stevia extract guarantee its delicious taste. Alcohol Humans have usted alcohol in various forms for thousands of years. Calendula officinalis flower extract This lovely bright orange flower is commonly called Pot Marigold. Calendula has a long history of use as a wound-healing and skin-soothing botanical. Chamomilla recutita flower extract German Blue Chamomile also known as scented mayweed a common wild flower, contains a valuable essential oil. Citric acid A weak safe organic acid found in citrus fruits and widely distributed in plants. Citrus grandis seed extract An extract from grapefruit used as a natural preservative due to its anti-microbial effect. Foeniculum vulgare oil An essential oil from the crushed seeds of the sweet fennel plant. Glycerin More properly known as glycerol. It is the natural molecular backbone to all lipids or oils and fats. Limonene Limonene is a natural constituent of essential oils with a sweet lemon-like odour. Propolis extract Propolis is created by harvesting the resinous mixture that honey bees, collect from tree bark, sap and flowers. Silica Silica is a natural substance found in most rocks, sand and clay. AS a fine powder it can be used as a mild abrasive. Sodium benzoate Sodium benzoate is a salt derived from benzoic acid and is used as a preservative in foods and cosmetics. Stevia rebaudiana leaf/stem extract This herb is a member of the chrysanthemum family and is used as healthier sweetener or sugar substitute. Vanilla planifolia fruit extract One of the world’s favourite flavours. It is widely used in perfumery but the seed pod of this orchid has many valuable properties. Xanthan gum It is produced by the fermentation of glucose, sucrose, or lactose.